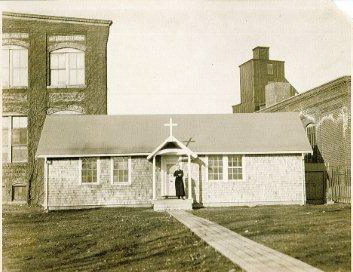 The original chapel building at 980 Memorial Drive. In October 1929, the stock market crashed, sending the nation into the worst economic depression in history, the Great Depression. 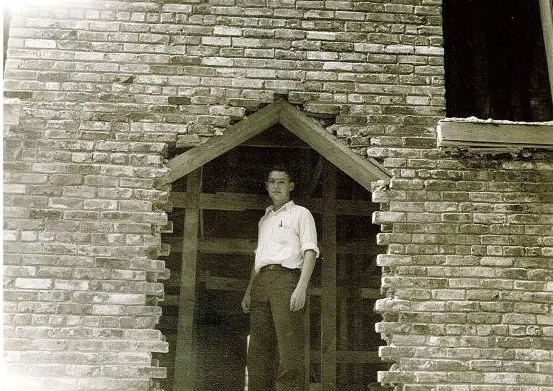 During this time, Spence Burton, the superior of SSJE, was working with the celebrated architect Ralph Adams Cram on plans for the new Monastery on Memorial Drive. The project, when finished, would not only enable the Society’s work in the spiritual formation of students, lay people, seminarians, and clergy, but would also be a living monument to the Society’s hope for the future. 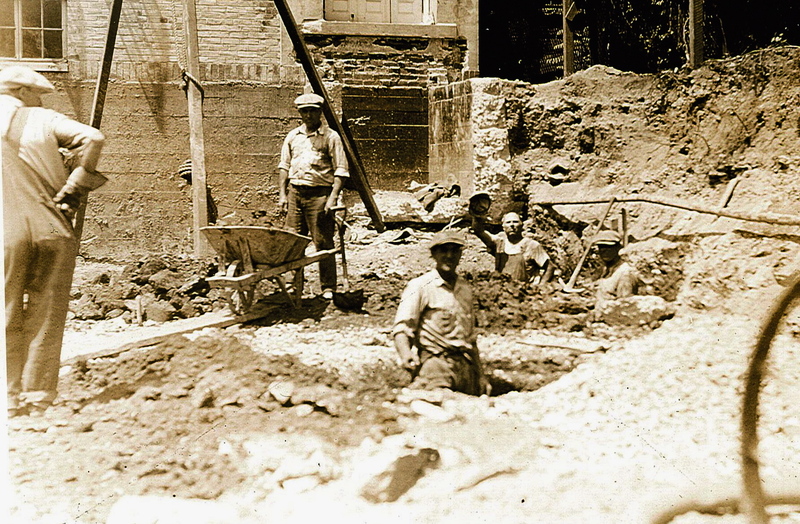 When the Great Depression first hit and many banks and companies failed, most building projects in the nation came to an abrupt halt. But hope persisted among the members of the Society that a way forward would be found. 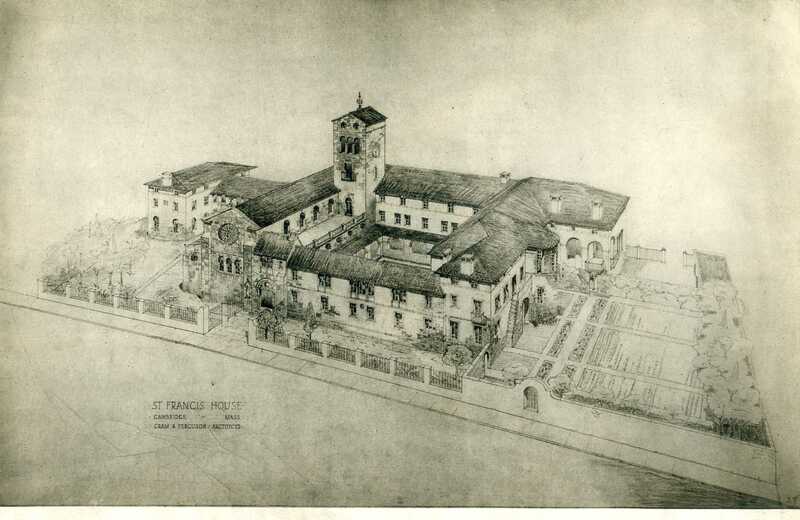 Burton and Cram continued to work on the plans for the new monastic complex, with Cram finishing his first sketch of the proposed buildings in 1929. 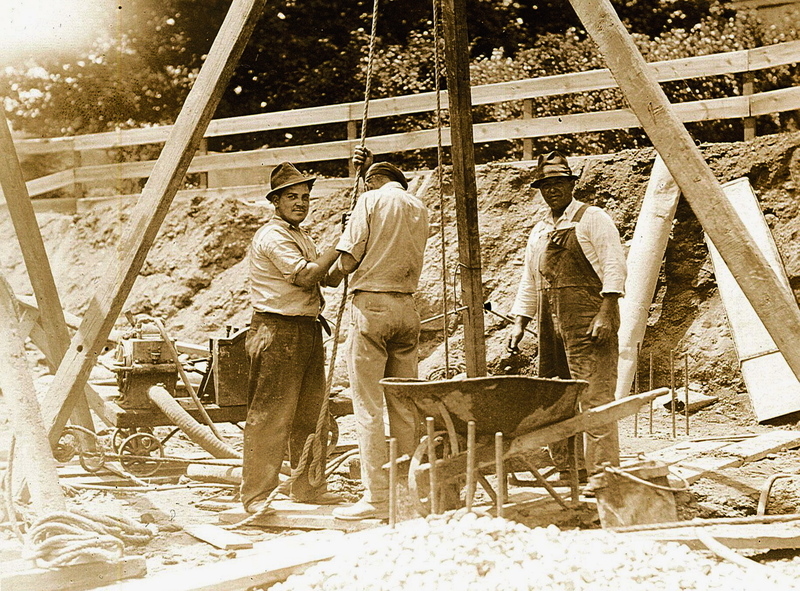 Then, in the early 1930’s, Burton’s parents died, leaving substantial funds to continue the project. The new chapel would be built as a memorial to Burton’s mother, Byrd Waithman Spence Burton, as indicated by the memorial stone placed below the Rose Window (now concealed by the current organ). The main unit of the new Monastery would be dedicated to Burton’s father, Caspar Burton. Cram’s original design for 980 Memorial Drive. The Monastery Chapel was the last major architectural statement of one of America’s most important architects. Ralph Adams Cram had made a powerful impact with some of the highest-profile buildings in the country: the Cathedral of Saint John the Divine in New York City, the chapel and several other buildings at Princeton University, the buildings at West Point, and other projects. He played a role in designing the National Cathedral in Washington. Cram wrote extensively on the importance of the Gothic Revival style and had profound influence on how people thought about churches. And he also devoted himself throughout his career to smaller buildings, including several chapels. While he built churches and skyscrapers meant to soar upward and dominate their surroundings, the chapel he designed for the Monastery in Cambridge brings to fitting culmination another strand in his celebrated career, that of creating an intimate setting monastic worship. Cram designed the Monastery Chapel in the Romanesque or Norman style, with a monastic choir, arches, and an apse containing the high altar. It was constructed of granite from a quarry in Quincy, Massachusetts, with Indiana limestone for the pillars and arches. For the floor of the choir and sanctuary, marble from Tennessee as well as from Belgium, France, and Italy was used. Cram, who would often reuse materials in his designs, obtained large beams that had once been part of a wooden bridge over the Mystic River that had recently been pulled down. These beams were used in the roof of the chapel, as well as the roof of the new refectory in the Monastery wing. Cram also designed a regal tower, eighty-nine feet in height, to connect the chapel to the Monastery wing. It provided for storage space, an incredible view of the area from its top floor, and an organ chamber in the second floor (in which an organ has yet to be installed). The Monastery wing, like St. Francis house, was built of brick and tile covered with light gray stucco. Construction was finished within a year, but no money had been put aside for outfitting. Later, a baldachino was added over the high altar, funded by friends of the Society from New York City. The magnificent windows of the Chapel are of stained glass from the studio of Boston artisan Charles J. Connick. Gifts from across the nation provided furnishings for the Brothers’ cells, common rooms, refectory, kitchen, and laundry. Cram was aware that the great European monasteries were built gradually over time, adding buildings when the need arose, and when finances made it possible. So the new Monastery on 980 Memorial Drive was intentionally left incomplete. Architectural oddities in the chapel—unnoticed by most visitors—suggest places where Cram imagined the complex could still grow in the decades ahead. A door high up in the outside wall, beside beside the clerestory, is accessible only through the balcony that skirts the Chapel’s eastern wall in the cloister garden. The door leads nowhere. Cram imagined a gatekeeper’s lodge might one day take that spot, so he built a door into the thick stone wall. The organ loft beside the altar has remained empty and was long ago converted into the Society’s archive. Even the cloister itself remains unfinished: Cloisters are normally square spaces, fully enclosed by their four walls. While he built only the two wings now there, Cram imagined that two additional wings would be added to complete the cloister. Those two wings, visible in the eariest drawings of the Monastery, have never been built. There is something profound in the perpetually unfinished state of the Monastery. Incompleted, the Monastery points to the continuing work of creation. It points to the promise of God’s fullness of time. It points to the work of conversion that, every day, is making each of us more fully into God’s image.